"...This novel gave me a happy buzz. Remember when SF used to be upbeat and fun? Well, the fun is back and it's right here." 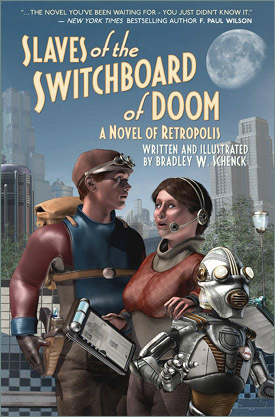 "...a madcap mash-up of retro-sf, full of fearless heroes and heroines dashing about like Flash Gordon meets the Keystone Cops." 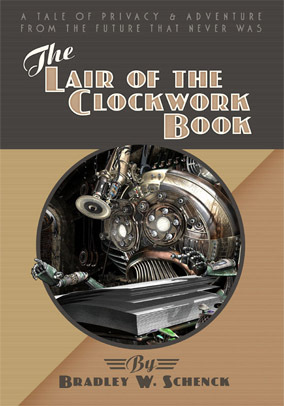 "Like a madcap retro-tech collaboration by Terry Pratchett and Isaac Asimov. I loved it!" 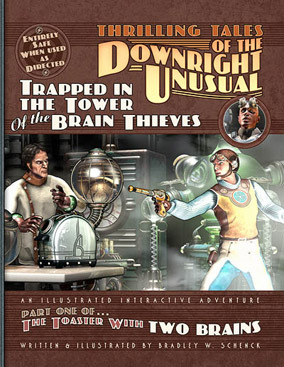 On the other hand... maybe you've read the web version and liked it, but you don't really want it as a book. It could happen. Then you might also like to know that at my Retropolis site I offer T-shirts, posters, prints, business cards, coffee mugs, blank books and lots of other things, all featuring my art of the retro future. And beyond that... well, I've also designed another line of t-shirts and hoodies, blank books, posters, archival art prints, business cards and other merchandise all decorated with celtic art designs. Those are at The Celtic Art Works. Then there are other widely assorted ventures like, say, The Non-Conformists Union, Local 404, or Hot Wax Tees. there's just no telling what I might get up to. If you want to know the latest you can usually find me at my Webomator blog. The very best recommendations come from those we know and trust - so if you have your own blog or web site, and you do enjoy the Thrilling Tales, please share that with your readers! 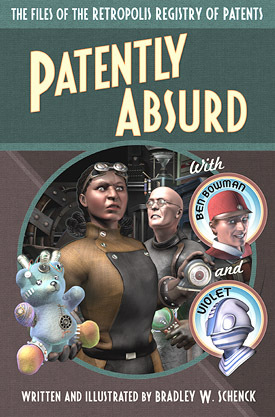 Posting about the Tales is one thing - and a great thing, mind you - but your site can also display a banner or a Derange-O-Lab widget like the The Incredible Portable Personal Title-O-Tron - your site's very own version of the massive Title-O-Tron found here in the Derange-O-Lab. 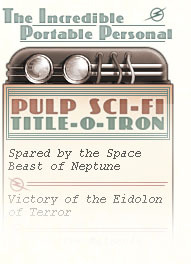 The Personal Title-O-Tron is sleek and sidebar-sized, but it packs the same awesome power as the gigantic original device... so it can crank out those random Pulp Science Fiction titles all day and all night long, no matter what the giant robots are doing outside.